It is my pleasure to write this humble notice to my brothers and sisters in the riverine area with the information gathered by the Indigenous people of Biafra (Ipob) under the leadership of Mazi Nnamdi Kanu, which says that the Indigenous people of Biafra (Ipob) includes them in the map because of oil in their region, I came to understand that lack of information and ignorance is a disease if not cured can make one blind forever. My brothers and sisters, the history is clear despite your oil we are one blood and can never be different as a matter of fact the man that named our nation Biafra is an Ijaw man in the name of His Royal Highness Chief Frank Opigo. There was Biafra before 1967-1970, your region was inhabited by the descendant of Ephraim Mitchell map of 1839, stated the important estuaries from were the rivers flow into the ocean was called Ephraim town which is located at 60 miles from river Nun which is in the so called Niger Delta of Nigeria today. The river was named after Nun the father of Joshua from the tribe of Ephraim. The question now is, who are the most afflicted, deprived and most killed in the contraption called Nigeria? Biafran people are the most fruitful, blessed by nature and skills within the contraption called Nigeria before 1967-1970 genocide war against Biafran people. You were killed in thousands by northerners and westerners during the war, all your public facilities were completely destroyed including schools, churches, hospitals, markets, power Plants, post offices in Biafra land which is the so called Niger Delta, and south east were desolated with no life amenities. After the war in 1970, Chief Obafemi Awolowo the finance minister gave 20 pounds to every Biafrans no matter the amount you had in your account and declared our properties in their land as abandoned properties including Portharcourt, were the Ikwere people denied their identity as being Igbo with the intention of annihilating and breaking the spirit of Igbo's just to make you perpetual beggars and people of no hope for the future. The rest are history today which you can confirm yourself. Today an average Igbo man that has his Igbo identity are far much better than every other Nigerian from all perspective. You can disprove that if you think otherwise. You can remember the Odi massacre, an attack carried out on November 20, 1999, by the Nigerian military on the predominantly Ijaw town of Odi in Bayelsa state. The attack came in the context of an ongoing conflict in the Niger Delta over indigenous rights to oil resources and environmental protection. Now, they said that Igbo's wants your oil, how many oil blocs are owned by the Igbo's? But it is clear to you that all oil blocs are owned by the Northerners and Westerners. The Ogoni people have been victims of oil spills, oil flaring and waste discharge, the alluvial soil of the Niger Delta is no longer viable for agriculture. Furthermore, in many areas that seemed to be unaffected, groundwater was found to have high levels of hydrocarbons. In 1990, under the leadership of Ken Saro-Wiwa he planned to take action against the Federal Republic of Nigeria and the oil companies. Then in 1994, Ken Saro-Wiwa and several other MOSOP (Movement for the survival of Ogoni people) leaders were executed by the Nigerian government. Yet, they will still tell you that Igbo's wants your oil. 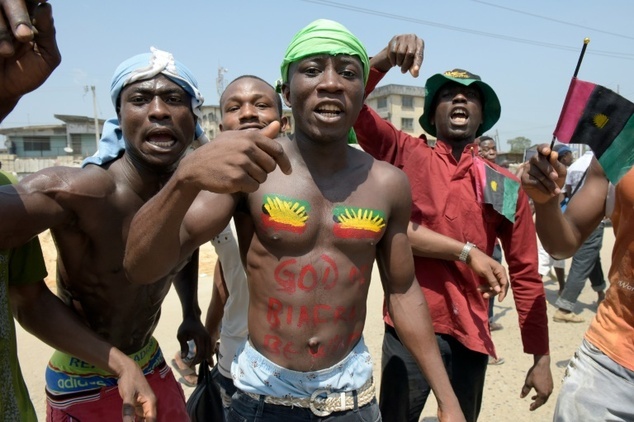 The Biafrans ethnic nationalities are: Igbo, Efik, Ibibio, Annang, Ejagham, Eket, Ibeno and the Ijaw among others, and this great nation has been in coexistence thousands of years ago as Biafran people before we lost our sovereignty to colonial powers, and before being balkanised into various countries like Equatorial Guinea, Cameroon etc. The archaeological evidence and African ancient map stands as a prove that Biafran people are a nation and are indigenous people. Therefore, we urge our brothers and sisters in the riverine area that we are one and indivisible people ignore and overlook the false information given to you by your ancestors on how Igbo's invaded your region during the war and humiliated them and took over your land before the intervention of the Nigerian army all those lies were concocted by the Northerners in a way to have hatred to each other. The Biafra constitution will be supreme and will be made by the people of Biafra through the majority of the people, each state will control and manage the resources they own. The states will only be paying tax to the Federal government, that will have no authority to interfere in the state resources. There will be nothing like; Federal Capital Territory (Abuja) each state will build their own capital territory, there will be no intimidation by any policemen. Everybody will have equal right to extend if you are appointed to be a President. My dear brothers and sisters from the riverine area wake up, you can not own a land without securing the mat. "A word is enough for the wise". Here, I rest my case. BIAFRA NATION IS BLESSED ALREADY BY THE MOST HIGH,THE ALMIGHTY & SHALL NOT BE CURSED . NO AMOUNT OF INTIMIDATION & EFFORTS MADE BY HER ENEMIES SHALL QUENCH THE FIRE BURNING & IN NO DISTANT TIME,SUDDENLY BIAFRA SHALL HAVE HER SOVEREIGNITY RESTORED @ LAST IN JESUS MIGHTY NAME I PRAY!!! A M E N.
Thank you very much for sharing this historic facts to my Brothers and Sisters in the Presents day South South. South South is Biafra and Biafra is South South. The Question I want my South South Brothers and Sisters to ask themselve is that, if our Brothers and Sister in the presents day South Eastern Nigeria share the Oil with us in the region, it is better for 11 state to share the Resources and develop the region than to allow 36 state of Nigeria share the Oil without any meaningful development to show in these region.Let Mathematician and Economics proved me wrong if I didn't make a common Sense. The greatest mistake the South South state will make is that, if only the 5 Eastern state championing this Agitation succeed without the South South state. This imply that the South South peole is doom for life and Nigerian government will enslave the South South state for life. God forbid this to happened.South South people should join this struggle why I encourage the Organs of Ipod to consult all the ethnic nationality that make up the presents day South South state on what they stand to gain when the new Biafra flag comes onboard so that they will see the Danger ahead in the Nigeria projects. It’s time my people from the so-called South-south (Niger Delta) in the riverine wake up from our metal slavery and join our brothers and sisters in Southeast to restore Biafra. We must wake up from our slavery mentality and falsehood planted by Hausa-Fulani, Yoruba and British colonial masters. How there these evil and wicked people tell you that Igbo is our problem and that they will take our oil. But for over 50 years, that same people (Hausa-Fulani, Yoruba and British) have been taking your oil and massacring you and your leaders when you complain. Please it's time to stop the foolishness and be wise. How can Igbos take our oil, when Abia, Imo and Anambra have crude oil as well?